I am enjoying a short vacation in Amsterdam. It’s one of my favorite cities: tremendously livable and walkable, with beautiful parks and museums. While surrounded by the Dutch language, though, I find my thoughts drifting toward Spanish. This is partly because I’m always thinking of Spanish anyway, but there are also four specific reasons. There are many Spanish-speaking tourists in Amsterdam these days; most of them, from the sound of it, from Spain. I love all Spanish dialects, but this is a fun change from what I usually hear in New York. I’ve had the chance to use my Spanish a fair amount just chatting with fellow tourists. I’m in the middle of a terrific Spanish novel: Jordi Sierra I Fabra’s Cuatro días de enero, a police novel set in Barcelona in the waning days of the Spanish Civil War. 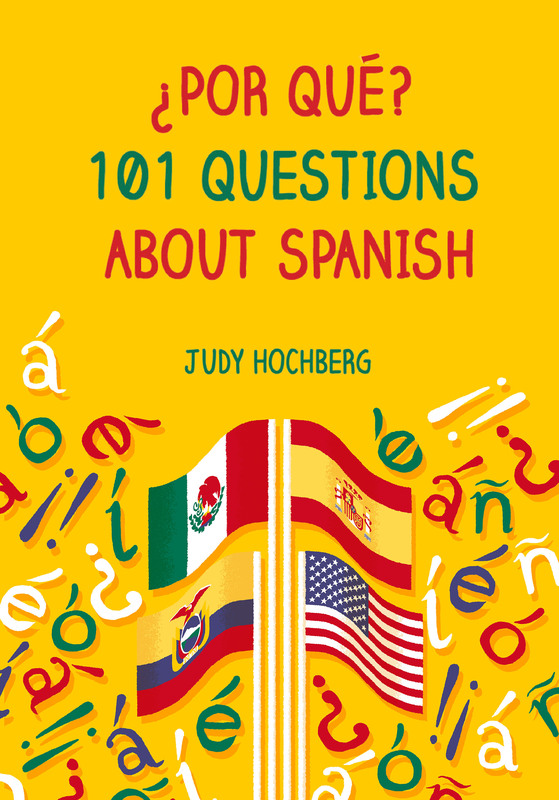 Reading Spanish for pleasure is one of my favorite pastimes and, as usually, I’m encountering some interesting linguistic phenomena in the book. I hope to be blogging about them soon. Our hotel happens to be across the street from an architectural landmark: Amsterdam’s Zevenlandenhuizen, or Houses of Seven Countries. This is a row of houses built in 1894 by the Dutch architect Tjeerd Kuipers in the style of seven different European countries: Germany, France, Spain, Italy, Russia, the Netherlands, and England. The Spanish house, 24 Roemer Visscherstraat, is shown below. It mimics Spain’s mudejar ‘Moorish’ architectural style, with keyhole arches and stripes of (faux) brickwork in alternating colors. In the picture you can just see the word “Spanje” (Dutch for “Spain”) over the front door. The legacy of the historical ties between the Netherlands and Spain is palpable here. For those of you who are unfamiliar with this aspect of European history, Spain controlled the Low Countries (today’s Netherlands and Belgium) during the apex of the Spanish Empire. Their drawn-out battle for independence from Spain divided the territory in both religion and politics. The northern portion, today’s Dutch Republic, achieved independence first and is predominantly Protestant; the lower portion, today’s Belgium, remained, like Spain, primarily Catholic. This divide indirectly explains a geographical oddity: the city of The Hague, some 41 miles south of Amsterdam, is the seat of government of the Netherlands today even though Amsterdam is the country’s constitutional capital. To quote Wikipedia (since I’m a linguist, not a historian): “After the Napoleonic Wars, modern-day Belgium and the Netherlands were combined in the United Kingdom of the Netherlands to form a buffer against France. As a compromise, Brussels and Amsterdam alternated as capital every two years, with the government remaining in The Hague. After the separation of Belgium in 1830, Amsterdam remained the capital of the Netherlands, while the government was situated in The Hague.” Who knew? Painting after painting in the Rijksmuseum, which I visited today, portrays the war between the Netherlands and Spain from the Dutch perspective. 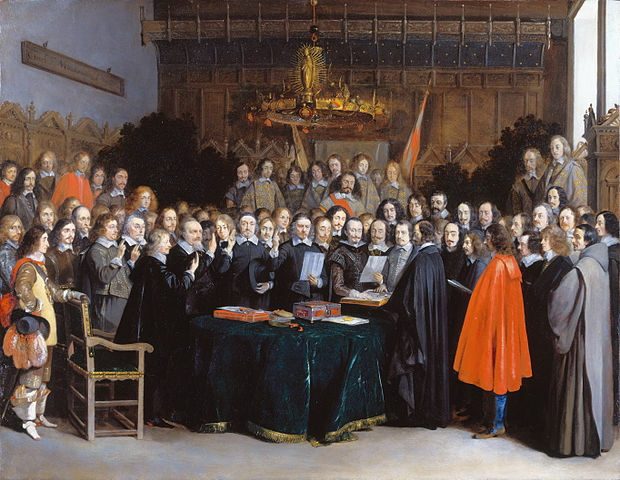 An example shown below is Gerard ter Borch’s depiction of the ratification of the 1648 Treaty of Münster, which ended the war between Spain and the northern provinces. 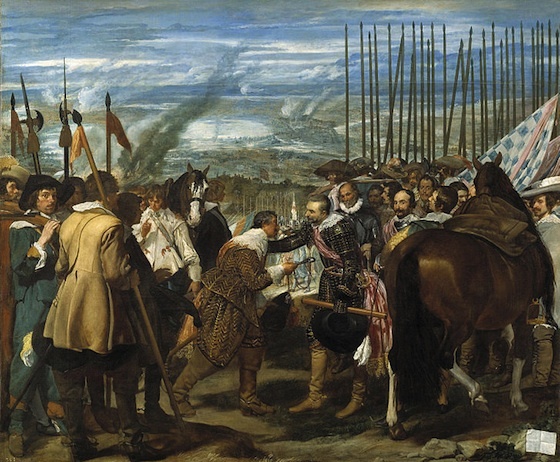 I’m planning a trip to Spain this summer and am looking forward to revisiting the paintings in its collection that show the same war from the Spanish perspective: most notably, Diego Velázquez’s La rendición de Breda, which celebrates a 1625 victory. Maybe I’m biased, but I think Velázquez blew ter Borch out of the water. This entry was posted in Spanish in the world and tagged Spanish, Spanish Netherlands, Zevenlandenhuizen on 19 March, 2016 by jhochberg. Gracias por recomendar “Cuatro Días en Enero” usted. He comprado una copia Kindle, y he empezado a leerlo – muy lentamente, por supuesto, ya que estoy empezando a tratar de leer español más allá de las frases de ejemplo que memorizo diaria. El principio del libro es bastante tenebroso, y es un género que me gusta mucho en Inglés, así que estoy muy entusiasmada con este libro. Gracias de nuevo. Nancy, su español es excelente. Espero que sigas gozando del libro y que encuentres otros que te gusten igualmente. A propósito, debe saber que los nombres de los idiomas, como “inglés“, se escriben con minúscula. Ya he terminado el segundo de la serie y he pedido el tercero. Me encantan.